Sarah Ratcliffe, Ph.D., joined the UVA faculty in 2018, after 17 years at the University of Pennsylvania. She currently serves as the Associate Chair for Research, and Director of the Division of Biostatistics. Dr. Ratcliffe has a background in statistics and computing, with specific training and expertise in the analysis of correlated data, especially longitudinal and functional data, in predictive modeling, as well as expertise in modeling informative missing data / dropout. 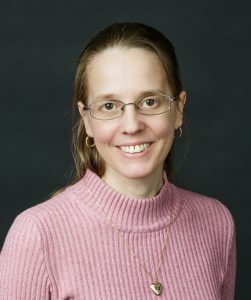 She is currently MPI of an R01 developing novel statistical methods for longitudinal biomarker trajectories with informative dropout using functional data analysis techniques, and MPI/DCC director for the Sustained Aeration of Infant Lungs (SAIL) trial. Additionally, she is a co-investigator on various clinical studies, leading to clinical research publications in numerous disease areas, including neonatology, fetal and maternal medicine, women’s health, HIV/AIDS research, cardiology and critical care medicine. Dr. Ratcliffe serves as the statistical member on several DMBs, is a reviewer for NIH study sections, and is the 2018 ENAR President-Elect. Longitudinal and functional data analysis, joint modelling / informative dropout, predictive modelling. Functional data analysis (models for complex curves), joint models for longitudinal and survival data. Research projects include modeling of changes during labor, and modeling RFM data.